as you want for FREE? The internet information I gathered about chocolate factory tours before we left for Switzerland really paid off. I can’t imagine a more entertaining factory tour for kids and teens than La Maison Cailler, and it is FREE for kids under 16 years old! The Cailler chocolate factory is located in Broc, just outside Gruyères, and combining the tour with a visit to Gruyères on the same day is just about one of the best times you could ever have in Europe. The train system in Switzerland is phenomenal, so wherever you are in the country, hop on one to Bulle. At the Bulle train station you will find a little red and white trolley train that says La Gruyère on the side. This 11 minute ride will take you to Maison Cailler and back to Bulle, with breathtaking scenery along the way. The route travels right by Château de Gruyères, perched up on a hill with a beautiful backdrop of mountains. Gruyères Castle perched up on a hill. The town of Broc is dominated by the chocolate factory and a Cailler outlet store; besides that, a small train depot and a few farms are the only thing you’ll see. (Though we didn't spot them, there are two hotels: Romantik Hôtel Broc’aulit and Hôtel de Ville.) Don’t worry if you enter the Cailler factory and see a huge crowd of people – they’ve got their tours streamlined, and before you know it you’ll be ushered into a room with your fellow native language speakers. (English at least every 15 minutes.) I truly was expecting the usual, bored, heavily-accented tour guide walking us from room to room reciting her spiel, but we – especially my group of teen girls – were intrigued to enter a self-locking room with no tour guide, but mechanized exhibits, automatically spotlighted when featured by the recorded narration about the history of chocolate. Aztecs performed sacred ceremonies with chocolate drinks in one chamber, the Spanish brought cocoa beans to Europe from Central America when we entered another, and the story of François-Louis Cailler came to life in the next. Yes, folks, the Swiss have Disneyfied, and the teens loved it. All age youngsters will love it. But the denouement of all food sampling occurs in the tasting room. Neatly separated selections of chocolate lined up in perfect rows on plexiglass trays await your trembling fingers as you realize that there is no signage limiting your intake, no thick-waisted matron standing guard, and no usher hurrying you through the room. Milk chocolate, dark chocolate, white chocolate, truffles, filled, creamed and whipped chocolate beckon you. As the trays empty a quiet staff member slips in and replaces them, constantly, repeatedly, heavenly. It's like a dream. All trays are labeled with their brands so that you can clearly identify your favorites when you step into the final stage of the tour: the gift shop. By the likes of what our group spent in the gift shop, I imagine Maison Cailler recovered the losses endured by letting eight unrestrained teenage girls loose in their chocolate tasting room. The girls and their shopping bags. Cheese and chocolate sounds like just about the perfect day! My younger daughter would be in heaven at a cheese factory and the older one at a chocolate factory - Switzerland may just be the perfect vacation spot for us! We spent a day in Geneva during spring break and fell in love with Switzerland - can't wait to go back! Oh my, so awesome! As if I needed another reason to visit Switzerland again, it is my favorite country already. Oh my goodness, I think I gained weight just looking at your pictures! And now I have an incredible craving for candy! I have enjoyed all your Switzerland posts these past months. This mouth-watering post and free, unlimited chocolate samples at this factory just moved it up on my bucket list. =) What a cool place and even before you get there you get rewarded with gorgeous views. Free chocolate? Where does one sign up? This trip sounds more fabulous with each post you write. What great memories for them. What I want to know is how much of that chocolate actually made it back to the United States!?! That chocolate looks delicious! Most young people and their families will go to wherever the treatment is based. But it does create enormous challenges particularly for anyone who is on a low income or is perhaps a single parent . . . If you are going to centralise you need to support people to cope with journeys and overnight stays. 1) after arriving at Broc Fabrique howdo I reach the chocolate factory? 2) how do I include a visit to the cheese factory? As soon as you arrive at the Bulle train station you will see the little tram/train to the chocolate factory - you can't miss it. 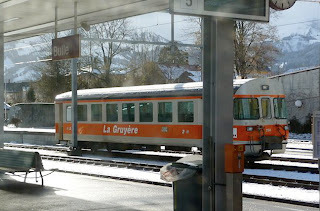 The cheese factory is right across the street from the Gruyères train station - it's also easy to spot! We r 2 families with kids visiting the chocolate factory. What is the fare on the red tram/train to the chocolate factory at Bulle. Also where can we find the train/tram timings listed online. If you have a Swiss rail pass, the train is free, otherwise it's 2.90 CHF per person. You can find the schedule at www.sbb.ch under the timetable tab. Just input Bulle (gare) to Broc (village). Have fun!! !